The following are answers to questions that have come up frequently over the past 8 years since the books were opened for ordering this new model. These are not official responses from Ford but what I have surmised from reading message boards, forums, email newslists, and word from friends with good Ford connections. Time to refresh these questions as some are no longer asked and new ones have cropped up. If you have questions that are not answered here, please sign my blog & ask it there or visit a discussion forum such as TBN and ask your question there. Be sure to check my sitemap to see if any subject you have a question about is located there. 1. What accessories are available for this car? visit the "accessories" page. There you will find accessories available from Ford with their parts numbers. A 2nd page also lists aftermarket accessories supplied by other companies - the list is not complete so you may find other sources of accessories for the Thunderbird. 2. My car shakes severely when going over rough road. Is this normal? The car should drive solidly. Take your car in to your dealer if the shake is is bad or getting worse. Visit the "problems" page for more info Also check your tire pressure - it should be set at 30psi. 3. Have there been any recalls on this car? Register your car on Ford's Car owner website and keep up to date with any recalls that directly affect your Thunderbird. 4. What do I need to do to prepare my car for winter storage? 6. Are there lifts available for the hardtop? Yes, there are 3 companies producing them for this model. Check the accessories page for their web addresses. 7. What can I do to protect the paint from scratches from the hardtop? Ford has made available a vinyl (mylar) tape kit just for this purpose. It's packed in all 03s and 04s plus more than half of the 02s. Check the accessories page for the part number and check the "New Car?" page for information about whether kit should be packed in your car or not. Watch the TBN for future developments. 8. What does the VIN code mean? 9. What is a "rotation number?" VIN's are assigned well before that car actually starts getting built, therefore it may not be in the actual order that that car goes down the assembly line. A "rotation number" is assigned to the car when it starts down the assembly line. This is a 4 digit number for the Thunderbird. The first series went from 0001 up to 9960 and then started over again. by knowing your VIN # and rotation # you can figure out the actual build or sequence number for your car. For example: my car's VIN # is 119005 with a rotation number of 8588. Because of it's high VIN #, I need to add 9960 to 8588 to get my sequence # of 18548. 10. Where can I find this "rotation number? You will find white stickers in various parts of your Thunderbird. Normally it just has your VIN# on it but you may find 1 or 2 stickers that not only have the VIN# on them but also the 4 digit rotation number located right above the VIN #. Most owners have found them on the driver's side front fender, under the hood. I also found one on the lip of my trunk lid. On the 04s, it appears to be on the lip of the trunk lid for the most part. 12. What is the difference between a premium and a deluxe model? Deluxe 02s vs Premium 02s - WHEEL STYLE is the ONLY consistent difference between the two. Deluxe without hardtop does not have traction control. 14. 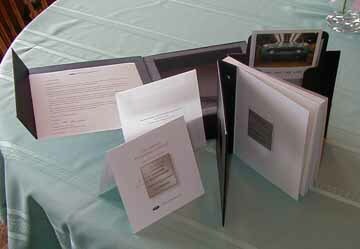 Are Owner's Manuals still available? If your retrobird is missing it's Owner's manual, you may download a free copy of the manual from Motorcraft. 15. Which year hardtop will fit my Retrobird? - All 2002-2005 hardtops will fit all&nbssp; years of the Retro Bird even if the t-bird didn't originally come with a hardtop. 16. Is my Retro Bird a convertible? Many may think that's obvious but there are owners buying a used Tbird that do not know! If the hardtop is installed when you buy it used, it does come off and there is a soft top stored underneath. If you bought one without a hardtop and want one, any hardtop from any 2002 to 2005 will fit. You will need a special tool to install or remove the hardtop. It's a Torx T-40. Below questions are out of date but left here for your information. 1. Why haven't I received anything from the "Manage the Wait" Program? Answer: The "Manage the Wait" does not exist. It was dropped sometime in January or February of 2001. It was replaced with a different program, under a different name, and with a different set of rules. 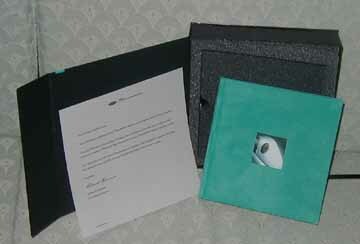 The new program is called the "Thunderbird Collection" It surfaced in May, 2001. Comment: With this program gone and the Thunderbird Collection enrollment over, there are those that ordered their cars early, and have never received anything from Ford or the dealer and are still waiting for their car.- Sept 02 - enrollment was extended to December 02 but that's still no excuse for the dealer not to offer anything to the owner for their order. 2. What is the Thunderbird Collection? the color of the car you specifically ordered. all displayed in a touch and feel manner. with your name and your car's VIN! 3. How do I get enrolled in the Thunderbird Collection? This is an ordered item. You were not automatically signed up for it when your car order was placed. However, the enrollment period for these has past. 4. When will the Thunderbird Collection be shipped? The 5 mailings willl be sent out in 3 month intervals. 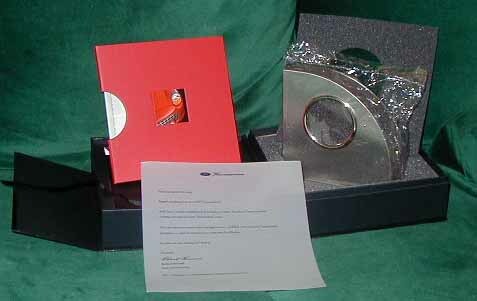 The first mailing was shipped in Mid August, 2001. The 2nd mailing is due in November, 2001 but actually came in December. 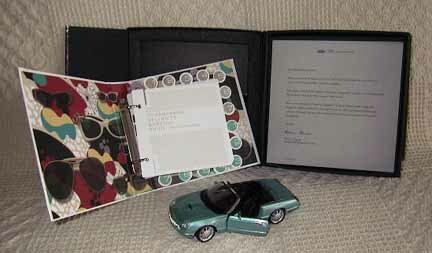 Some owners with cars have started receiving mailing #5 in January 2002. The 3rd mailings were at the end of February, early March, 2002. 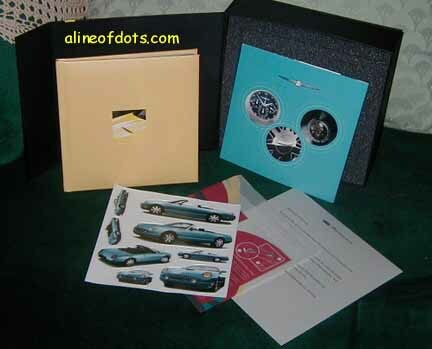 4th mailings started arriving at the end of May and the 5th mailings started arriving at the beginning of January to those that have received their cars. If you have received the first 4 but not the 5th and your car - that you ordered - has arrived, visit the Thunderbirdnest forum for more information about how you might obtain this missing part of the set. Hurry as there will be an end. 5. My Dealer does not know about this program - how does he find the information? This offer ended at the end of December 2001. 6. How Many 2002 Thunderbirds are Ford producing? Production is limited to 25,000 cars over the span of a year so that means ideally that about 2100 cars will be built each month. At the current rate, they are producing 564/week or app. 2500/month. Production is about 2 weeks behind predicted schedule. Production started at the beginning of June. Ford is limiting production of each model year to 25,000/ year. UPDATE AUG. 2002 - production will continue on the 2002 - may be close to 28000 total UPDATE Nov. 2002 - production of the 2002 will end the week of Nov. 10 - total production numbers for the 2002 will be around 32,000. 7. I placed my order months ago and still don't have a VIN#. How Come?? These are my observations from the past 13 months in following the release of the Thunderbird. 1 - Ford appears to have caught up with VIN# assingments and now are posting them about 4-6 weeks before car is delivered or 3 weeks before car is built - this is approximate, so don't bet on it. 2 - Your assignment depends on your order # within your dealer's allotment. 3 - A dealer's allotment is supposedly spread out evenly throughout the production year which appears to be from June 2001 to sometime summer of 2002. 4 - If you ordered the hardtop, this also appears to affect when you'll see your VIN#. Apparently Ford is pulling any non-hardtop orders to the front if they can. Comment: As Feb 2, 02, I'm starting to feel the anxiety of the long wait. VIN# assignments are in the 12,000 range which is only 6000 short of 18,000 - the number of cars ordered as of June 2001. My order was placed at the beginning of March but I'm #18 of 26 at my dealer & my dealer has only received 7 VIN#s so far. It appears that 18,000 VIN#'s will be assigned before they ever get to my VIN#. The wait is even harder as I "see" other owners receiving their cars and they're the same as I've ordered. It is now April 7, 02 and my dealership has received 13 VINs of the 26 alloted to them - half way thru their orders.